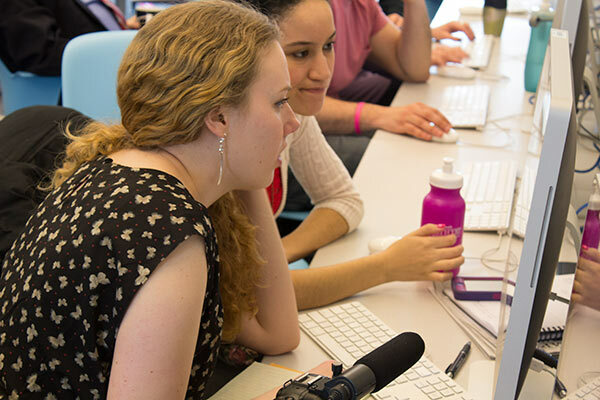 Journalism classes at the University of Connecticut are, for the most part, small — no more than 16 students in writing or editing class. Instructors work closely with students. Students write, and rewrite, extensively. Written work is judged by professional standards: for thoroughness of reporting, precision, clarity, fairness and writing style. Students are expected to correct problems of grammar, syntax and spelling before work is submitted. Because our students are preparing for a profession in which deadlines are absolute, late work is not accepted. A – No factual errors; a first-rate lead; no major mechanical errors, sound structure, organization, throughout; thorough coverage of the story subject; excellent writing throughout – in other words, of publishable quality as is. B – No serious factual errors; an acceptable lead; acceptable story structure, organization; very few mechanical errors; thorough coverage of the story subject; clear, concise writing – could be published with minor copy editing. C – No serious factual errors; an acceptable lead; acceptable story structure, organization; few mechanical errors; adequate coverage of the story subject – could be published with average copy editing. D – Minor, sloppy factual errors; weak lead; poor story structure, organization; several mechanical errors; inadequate coverage of story subject; unclear, foggy writing – could not be published without substantial copy editing or rewriting. F – Major factual errors including misspelled names; plagiarism, missed deadline; unacceptable lead; unacceptable story structure, organization; omission of important information; numerous mechanical errors – the kind of errors that would cause the story to be returned to the reporter for a second effort. Students must learn to think critically before they can report well. They must learn to report well before they can write well. They must learn to write well before they can edit well. Each step in this educational process demands a great deal of the student — and of the professor. Our students report, write and rewrite from their first news writing class onward. The workload is heavy. The grading is tough. The results are rewarding. Because deadlines are important in our profession, they also are important in our department. No late work is accepted unless students have received prior approval from their professor. Class attendance is expected; it is not negotiable. All forms of cheating, including plagiarism, are taken very seriously. The department follows the University’s procedural guidelines for dealing with such cases. The common punishment is failure in the course. All sections of writing and editing courses are small. There are never more than 16 students in a class. All of our writing and editing classes are taught in one of the department’s two computer labs. We know our majors. We know their strengths and their weaknesses. We work with them in and out of class. We are their professors, their mentors, their editors and their coaches. When they graduate, we are their biggest fans. Students are urged to gain experience before graduation. Many work at the student newspaper or the campus radio or television station. Others gain experience through freelancing, part time and summer jobs, and internships . Students should discuss their plans with their academic advisers early in their academic careers. University Career Services is also a very good resource. Graduates usually find their first jobs as reporters or editors at small or mid-sized newspapers, magazines or radio and television stations, and then progress to larger organizations. Alumni have worked at The New York Times, The Wall Street Journal, The Hartford Courant, The Providence Journal-Bulletin, The St. Petersburg Times, The Detroit Free Press, AP, UPI and ABC News, among other places. They range from local reporters to foreign correspondents, from television-news producers to magazine editors, from radio newscasters to Congressional press secretaries. No graduate courses are offered.